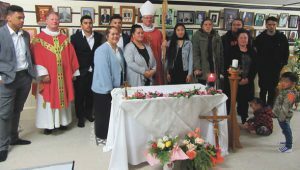 Bishop Charles Drennan confirmed eleven members of Ngā Paerangi whānau at a joyful and warm occasion at Kaiwhaiki Marae, Whanganui, on the feast of the Body and Blood of Christ, 3 June. Fr Marcus Francis, parish priest of the Catholic Parish of Whanganui – Te Parihi Katorika ki Whanganui, assisted. Bishop Charles prayed the Holy Spirit – Te Wairua Tapu – would strengthen their journey through life. Sr Makareta, Merekanara and Hoani Ponga supported by kuia were katekita (catechists). The newly confirmed in front of photos who have gone before them in faith. Back (l-r): Te Rangitautahi Ponga, Fr Marcus Francis, Te Poutahi Ponga, Tawaroa Ponga, Bishop Charles Drennan, Ina Whanarere, Manaaki Baron-McRitchie, Joseph Barber and Te Ao Maro Baron-McRitchie. Front: Whakaae Baron, Maewa Love, Ariana Love. Not pictured: Merenia Ratana-Peina.